Stanford Athletics announced on Thursday night that senior goalkeeper Emily Oliver has medically retired from the team due to a series of concussions. Oliver, a three-time College Cup All-Tournament player and two-time All-Pac 12 first teamer, had allowed two goals in the team’s first three matches of the season before leaving the pitch in the 41st minute of the team’s August 31 match against Portland. The Flossmoor, Ill. native enjoyed a phenomenal freshman 2010 season in which she took over goalkeeping duties in the team’s fifth match of the season. Her season goals-against average of 0.31 set a new record for Stanford freshmen and was third in the nation, earning her All-Pac 10 honorable mention accolades as the Cardinal ultimately lost to Notre Dame in the NCAA Championship. Oliver showed no signs of a sophomore slump in the 2011 season, becoming one of the most dominant goalkeepers in the country as she led the nation with a 0.23 goals-against average while allowing only five goals and earning 12 shutouts. She finished that season with a 20-0-1 win-loss record and was a crucial part of the team’s NCAA Championship title. After an injury-shortened 2012, expectations were very high for the four-year starter to have another spectacular season before her collegiate career was cut short. 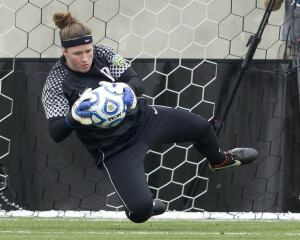 Touted freshman Jane Campbell has since been starting at goalkeeper in Oliver’s place. Moving forward, Oliver will act as a mentor to Campbell and the other goalkeepers on the squad.